I’ve had a serious crush on Dr. Gregory Berns ever since he published his first MRI studies. Those showed that dogs’ brains’ pleasure centers light up when they catch the whiff of a beloved human (or dog). There’s so much to love about his papers and his book How Dogs Love Us. So I was really excited about reading his newer book, What It’s Like to Be a Dog. It’s well worth reading, and I enjoyed it. But … it wasn’t what I was expecting. There’s some really cool stuff, like the explanation of how dogs’ brains look when they’re doing the equivalent of the Marshmallow Test. I’ve played around with that a bit with Koala and Alberta, though I lack access to an MRI machine. So I was very interested in his findings. It turns out that some dogs do well with deferred gratification and others … not so much. You might notice that I haven’t talked about doing a marshmallow test with Cali. I don’t need a fancy machine to tell me that she lacks impulse control. I was a little disappointed with some of the detours from living dogs’ brains into the long-ish discussions of the brains of deceased seals and Tasmanians. And I was distressed by the chapter on dogs and language. Dogs communicate. They use their whole bodies — ears, tails, hackles, eyes, facial expressions, as well as scent and sound, to communicate. And dogs excel at reading the nonverbal communication of other dogs, humans, and often of other animals like cats. Other non-humans do this as well. Dogs are able to read humans far better than humans can read humans. And dogs understand a lot of what we say to them. They might be assigning meaning to a combination of words and body language cues to understand our feelings, our desires, our mood rather than attaching the specific meanings that we do to individual objects or concepts. While I don’t expect Cali to speak to me in English or read the newspaper, much of the communication that I have with Cali — and especially what I had with Jana — is clear and meaningful. Berns’s discussion of language, how he tested dogs’ understanding of words, and his interpretation of those results are very, very human-centric. He talks about the mirror test, which I believe is not a fair test for dogs. His comments on dogs’ lack of a sense of self or others: “My beloved Callie probably didn’t have abstract representations of me or my wife or my children. No, I was just that guy who feeds me hot dogs …” are off-base. Dogs’ sense of self and others is primarily rooted in scent, not sight or sound. Berns himself showed that dogs recognize the scent of family members and respond differently than to the scent of unfamiliar humans or dogs. So I was mystified and saddened by what felt like a dismissal of the individuality of dogs’ selves and their relationships with key humans (or non-humans). Despite a few disappointing chapters, I do recommend the book. 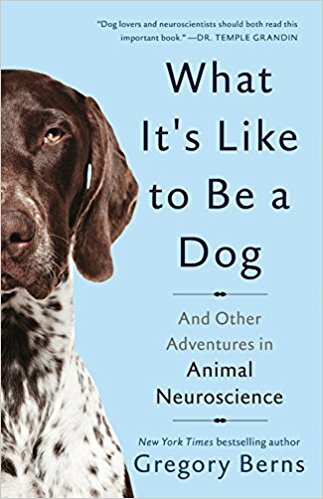 I the insights into how dogs’ brains work are fascinating, and even where I disagree with Berns’s conclusions, I enjoy learning about his research and his understanding of dogs. Dr. Berns is still my favorite neuroscience researcher, and he’s a great writer. Check out both of his books if you haven’t already!